The Law Office of Clive B. Jacques, P.C. is located next to historic Monument Square in Concord, Massachusetts, approximately 18 miles northwest of Boston. Take Route 2 west from Boston toward Concord. If traveling from immediately outside Boston, then take Route 128/U.S. I-95 to exit 29-B. Follow Route 2 for approximately 4 miles (you will go through 3 traffic lights) to a traffic light at Walden Street/Route 126. Turn Right and follow Walden Street 1.3 miles into historic Concord Center. Be careful to stay to the right when Thoreau Street forks off to the left – follow signs for the District Court. You will pass Concord-Carlisle High School, the Concord District Court and the Police & Fire Department along your way. 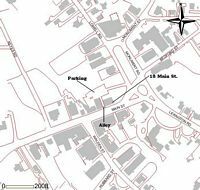 Walden Street will end at Main Street/Route 62. Turn right and the office will be the last door on your left before entering the rotary in Monument Square. There is parking behind the building which you can access by turning left off of Main Street into the alley right before Vanderhoof’s Hardware. The office is on the third floor. The office is just a short walk from the local commuter rail station. Take the MBTA Commuter Rail’s Fitchburg/South Acton Line from North Station to Concord Station (approx. 45 mins.). From the train station, turn right and proceed down Thoreau Street until it intersects with Sudbury Road. Turn left onto Sudbury Road and follow it about 3 blocks until it ends at Main Street (Route 62). Turn right onto Main Street and proceed about 3 blocks. The office is the last door on your left before entering the rotary in Monument Square. The office is on the third floor.